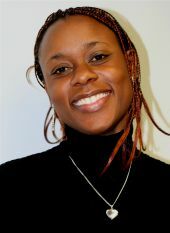 Sandra Bea was born in Kinshasa, Congo and attended the Muanjadi High School. During her time there she was enrolled in the teaching program where she learned the fundamentals of educating brave young women. It was at this time that Sandra began to dream of helping those class mates less fortunate than herself. After graduation Sandra attended I.S.P ( Institut Superieur Pedagogique), a college specializing in higher education for aspiring teachers. She spent a few years working in the Congo but soon moved to the United States were she met her husband Dan. They currently live in Colorado where they raise there two wonderful children. During the week Sandra teaches french at Global Village Academy located in Aurora, Colorado. After school is out for the day Sandra continues her work with helping those still struggling in the Congo. Three years ago she made her dream ours by founding Muanjadi Organization. Letitia is a world traveler with a passion for Africa; and DR Congo in particular. She has a BA in Linguistics and a MA in Education. Letitia has a dream that Muanjadi Organization will sponsor all the girls in high school and help them succeed in university. Letitia believes that through education the world of each student, their community and future generations will forever be improve. Connie believes educating women is the key to a nation's success. She is an avid world traveller and philanthrapist. She has a vested interest in the DR Congo, as her grandchildren were adopted from there. She has been working with MO for three years now. Marketing professional in Media and communications, Valerie is responsible to develop communication strategies that raise the visibility of Muanjadi Organization in the World. She develops and implements an integrated strategic communications plan to broaden awareness of Muanjadi Organization and serves as communications counselor to the organization leadership. Valerie has been described as the most influential African women by US-based multimedia networks USAfrica. She has worked for very successful international services corporations in the U.S.,and has used her expertise to enhance the market reach of those corporations. Valerie expertise reaches her native country, the DRC through lobbying and building of strong relationships with political and business leaders. Serves as Muanjadi webmaster and is responsible for keeping the office technology systems running smoothly. Originally from The D.R.Congo, David attended the Tshwane University of Technology in South-Africa. He now resides in Denver with his wife Julia, He offers his services as a contribution to the success of this project.